I was home alone tonight for dinner because half my family is at a Civil War Reenactment, and the other half is on their way north to see my uncle who has had a massive stroke, and is in the hospital. 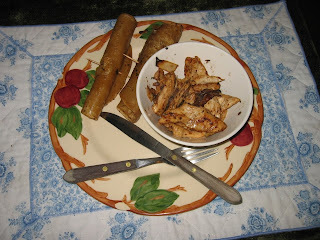 2 cups chicken, sliced into strips. Add chicken, Chardonnay and spices. Cook until the chicken is well done all the way through. Place chicken/onion mixture in a bowl. (Do not remove liquids.) Cover with several place-mats/towels to keep warm. Fry the tortillas in the butter mixture in the bottom of the pan.